It’s time for another CAS challenge over at Splitcoast. This time it’s a limited supplies challenge using only one color and one neutral. So for my color…Picked Raspberry Distress Ink and my neutral…black. Now when you look at the picture you might say…OK there’s more than Picked Raspberry…but honestly that’s the only color I used. By varying the amount I put on and using different mediums it really changes how the color looks. I started out with a sheet of white card stock and using my Picked Raspberry Distress Ink and a TCW template, lightly inked the hearts. 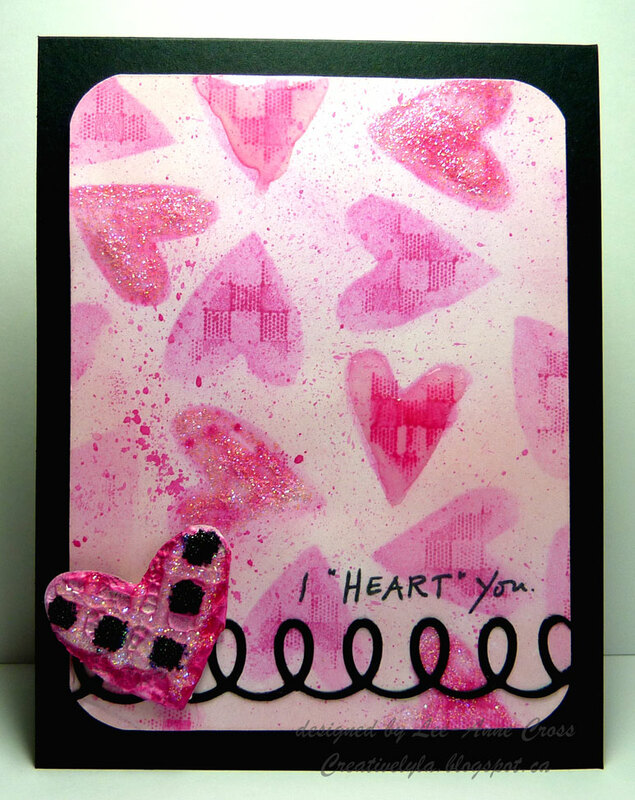 Then using my Impression Obsession Gingham Cover-A-Card, I pressed it down into the hearts over top of the template, thus adding bits of texture to the hearts, and adding more depth just using the same color. Next, I took a paint brush and a few drops of the Picked Raspberry re-inker and flicked it on to the card. Then I repeated this step, but added more water this time to get a lighter spattered ink. Then I sponged very lightly with the Picked Raspberry to completely cover the white. Next, by adding Stickles and Ranger Glossy Accents to different hearts I again created a different look as it changed the colors of those hearts. A MFT die cut in black runs across the bottom of the card. A simple sentiment stamped in black came next. The heart embellie is hand made. I cut a heart out of Tim Holtz Grungeboard and smeared it with Modelling Paste for texture. Next I pushed my same Cover-A-Card background stamp into the modelling paste to get the gingham pattern. Then I used my Glossy Accents to add black micro beads to resemble the gingham pattern. And, for just a little more bling, I used my Stickles to replicate the gingham pattern a little bit more. The edges were inked with Picked Raspberry Distress Ink. This was a fun card to do! It was a challenge sticking to the two colors but it can be done and you can have the illusion of many colors by varying your techniques/mediums. Have a great week stampers! Love the way you used the gingham CAC Lee-Anne! A fantastic cas valentine!! Previous Previous post: She’s Created A Monster!